I have a confession to make. 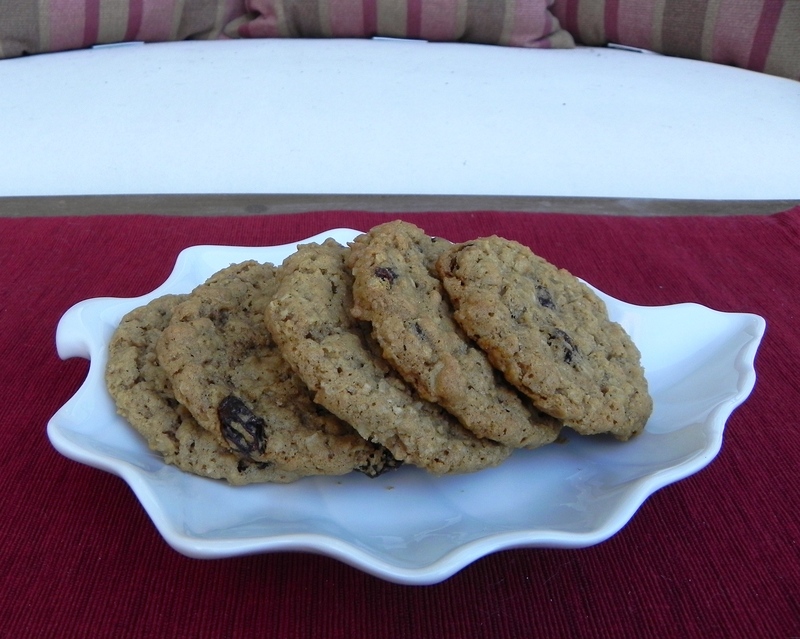 Before trying this recipe I had never made oatmeal cookies before. That could be why I innocently pushed forward when things seemed strange. The batter was wet and loose and I couldn’t form a rounded cookie; I thought the oatmeal might soak up the liquid. Nope. They spread like crazy and I ended up with a sheet-pan sized cookie. Upon analyzing the disaster, I made some major modifications in the recipe. The flour to oats ratio was off, so I added loads of flour and used fewer oats. There was also too much milk and too little baking soda. Generally for high altitude you add a little moisture and reduce leaveners, but in this case I did just the opposite. Then I adjusted the spices – I think all cinnamon and no cloves enhances the raisins. Ah, the sweet taste of success. Preheat oven to 350F. In the bowl of a stand mixer, beat together sugar, brown sugar, vanilla extract, and margarine until smooth and fluffy. Beat in milk a little at a time until well combined. In another bowl, add flour, baking soda, salt, cinnamon, and nutmeg, and stir until well mixed. Add flour mixture to the bowl of the stand mixture and blend to combine. Add oats and blend to combine. Remove bowl from stand mixer and stir in raisins. There were leftovers because my widespread family requested cookies. On their behalf, I will freeze some and see how they fare later. I haven’t made peanut butter cookies in years but I have a good reason. The last time I made a healthy peanut butter cookie I used freshly ground peanuts. Unfortunately, the nut butter they produced was dense and blew the motor on my hand mixer. My recent attempt to make peanut butter cookies fared much better and was less dramatic. It was labor intensive, however. I had to try the recipe several times because it made a doughy, dry biscuit and not a rich, chewy cookie. The recipe was already vegan so that required no alterations. The changes to the cookie ended up being less about making it high altitude and more to making it chewy while enhancing the peanut flavor. The final cookie was chewy with a pronounced peanut flavor. To achieve that I removed the brown rice syrup and used light brown sugar instead, while using more peanut butter and less flour. For higher altitude I added more liquids and used less baking soda. It took three tries but I think I finally got it. Preheat oven to 350F. Line baking sheets with parchment paper. In a large bowl, or the bowl of a stand mixer, whisk together the soymilk, flaxseeds and vanilla extract. Let sit for a few minutes. Stir in the agave syrup, brown sugar, canola oil and peanut butter. After baking this recipe several times for adaptations, I may actually be tired of peanut butter cookies. At least that means I will save a few for freezing. The first hurdle to this recipe was finding candy canes after Christmas. Fortunately, the rest came pretty easy. I applied some high altitude science to the recipe and added a bit of flour. To make it vegan I replaced the eggs with soy yogurt – this added moisture so I reduced the water instead of increasing it. Then I boosted the healthiness by using whole wheat flour for some of the white flour, agave nectar for the corn syrup, and less of the sugary topping. Then, because I love mint, I used peppermint extract in place of some vanilla. My first attempt made so many changes that I was unsure, but the texture, crumb, look and taste were achieved on the first try. Much to my surprise and excitement they were fantastic. In fact, I have dubbed them the best cookie I have ever made (so far). Preheat oven to 350F. Melt butter and chocolate together in a pan over low heat on the stovetop. Mix and set aside to cool. In a large bowl, whisk to combine sugar and yogurt. Add baking soda and salt. Mix well. Add agave syrup, water and extracts. Mix well. Add cooled chocolate mixture and mix with a spoon. Add all-purpose flour and mix. Add whole wheat flour and mix well. Cover bowl with plastic wrap and put it in the fridge for a few minutes while you make the topping. Place candy canes in a small bowl. Add sugar and mix with a fork. Line baking sheets with parchment paper. Take dough and roll it into walnut-sized balls with your hands. The dough may be sticky so roll only enough for the cookies you can bake immediately then place bowl in the refrigerator. Roll dough balls in topping and place on a cookie sheet, 12 balls to a sheet. Flatten slightly with your hand. Bake for 9-11 minutes. Cool on the cookie sheet then remove to a wire rack to cool completely. Yield: 3 1/2 dozen cookies (this is after I halved the original recipe). It was tough but I saved a few to freeze. I’ll check back on them soon to see how they fared. I hereby declare that March is National Vegan Cookie Month. I just made that up, but it sounds good, doesn’t it? My plan is to spend March making cookies. That’s a whole bunch of cookies, so I may freeze some. I’ve never had to worry about freezing cookies before as they don’t last that long in my house. But, that will be a new twist on my experiment. I will adapt recipes for high altitude and vegan (if needed) and then freeze them and see how they come out. If I have any left over. Uh, not likely. 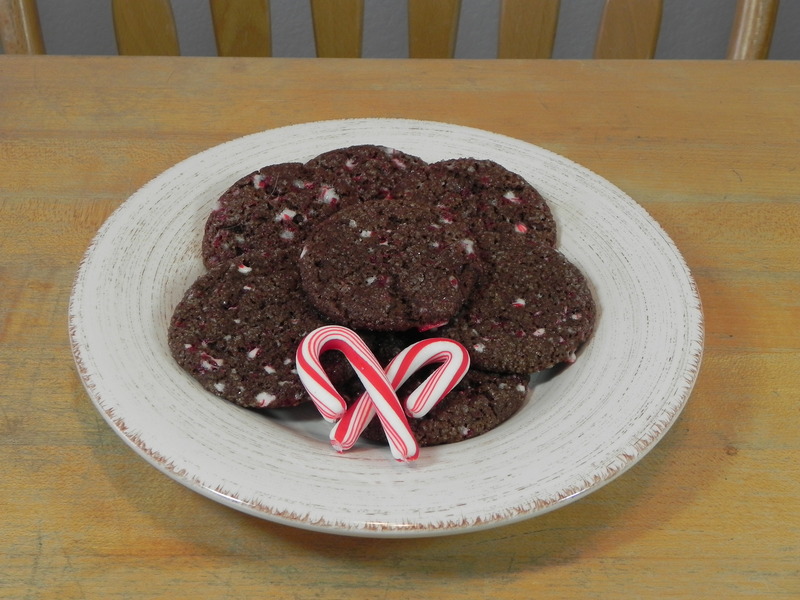 The recipes start with the deadly Chocolate Mint Cookies with crushed candy canes from a mystery (with recipes) called Candy Cane Murder. 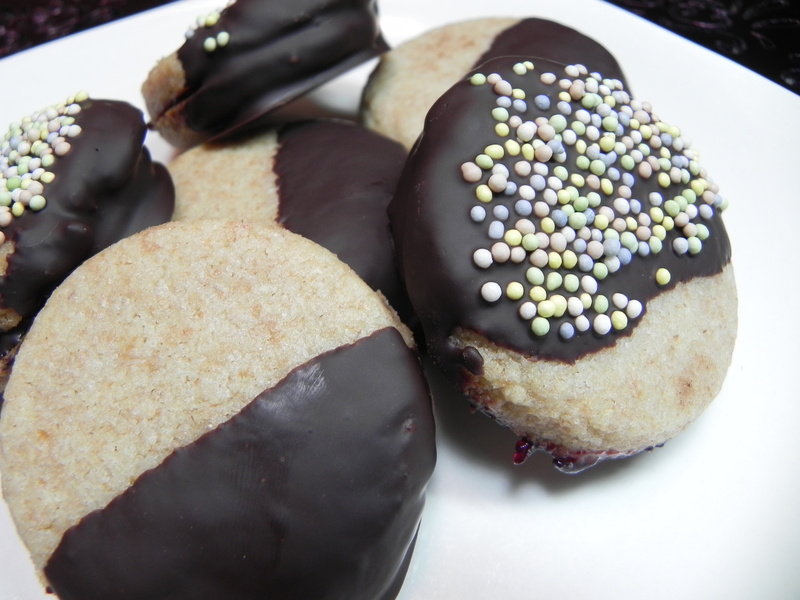 Then we move on to shortbread cookies that I will dress up by dipping and sandwiching with jam. 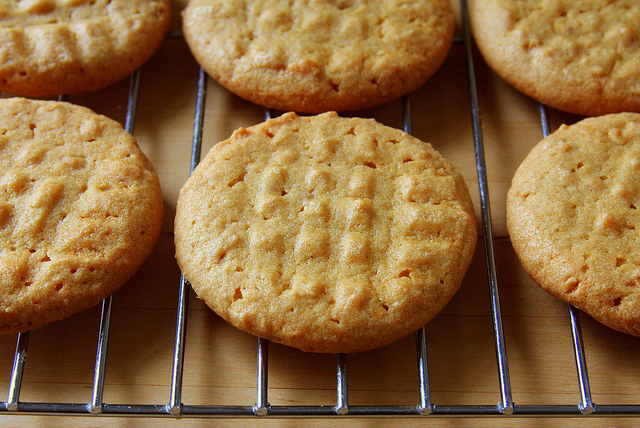 Next are Peanut Butter Agave Cookies from Vegan Cookies Invade Your Cookie Jar. (Viva la invasion). 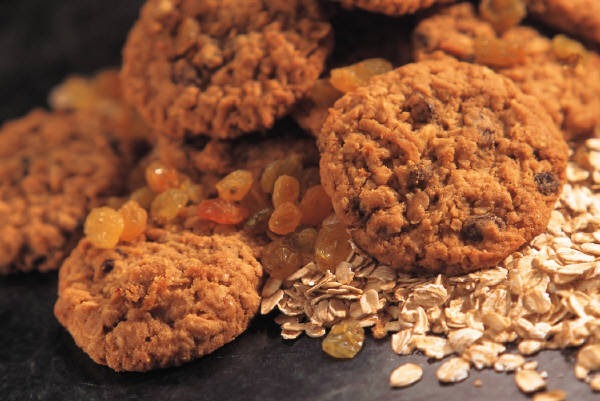 Our final delicious tryout is a classic – Oatmeal Raisin Cookies. I drool as I think of the fun and aromatic baking to come. Do you have a cookie recipe that you would like to see me adapt to be vegan and high altitude? Let me know and it may become part of the celebration of National Vegan Cookie Month.